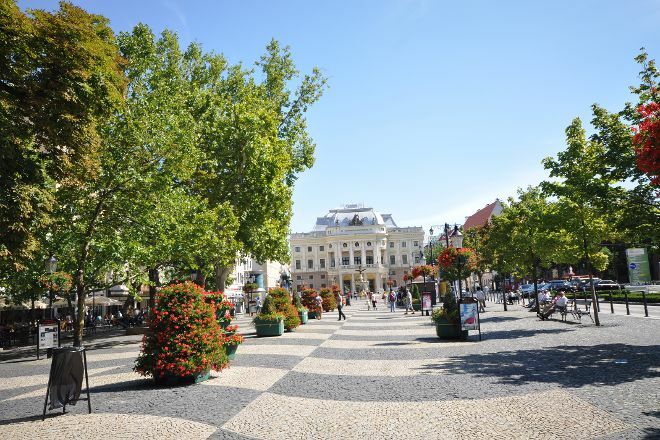 Named for one of Slovakia's most famous poets, Hviezdoslavovo Namestie serves as one of the capital city's main promenades and public spaces. Visit the square, a nexus for activity since medieval times, lined with historical homes, buildings, and trees. Stroll the promenade past embassies, stages for music and public speaking, fountains, and the famed Slovaki National Theater. Relax with a coffee or snack at one of many cafes along the square. Don't miss the statue of the plaza's namesake, Pavel Hviezdoslav. Plan to visit Hviezdoslavovo Namestie and other customer-reviewed, writer-recommended Bratislava attractions using our Bratislava trip website . Why is it called area? According to our views in this Boulevard. The wide pedestrian street, on which there are sculptures, monuments, fountains. Many different cafés and restaurants for all tastes. A lot of souvenir shops. .. Favorite tourist street, where you can just sit and relax in the shade of the trees. It's a Boulevard in old town. There is much going on. Everything is kept very clean. A tour out here worthwhile. Travel Tip: During a day trip by train from Vienna, it runs from central station to the Slavin 20 minutes - there are lots of stairs. Then it goes from there another 20 minutes to the Castle. Then we go in approx. 20 minutes to the blue Church. You can spend the noon/afternoon then wonderful old town before it again goes back on the night train to Vienna. Street attended from the NSP bus station go to old town and several monuments of the bronze statue, consist of restaurants on the street. One of the most popular squares in the Old Town of Bratislava, it extends from near the Novy Most (new bridge) to the Slovak National Theater. The beautifully paved square is lined with trees and is home to many statues and sculptures, restaurants, bars and important buildings. When I visited, there were many temporary stalls selling souvenirs. It is a beautiful walk and a great way to enter the old town. Beautiful place, but really crowded. Very good shade because of trees, thanks god! Nice atmosphere. The square underwent major reconstruction at the end of the 20th century. Before reconstruction, it looked like a small city park; now it looks like a city promenade. Very colourful in every season because if the lot of tourists. Huge number of restaurants, pubs and candy shop can be found here. Some events usually arranged on the open air stage in this square also. Must to feel the multicultural vibrations during evening walking in summer! Main attraction center of Bratislava.. Tourists can find almost anything arround the square with easy access to the center also..its sorrunded with wonderfull fountains and sculptures where you can get nice pictures and enjoy your ice cream or beer or food..
Every day, we help thousands of travelers plan great vacations. Here are some tips on how to use your Listing Page to attract more travelers to your business - Hviezdoslavovo Namestie. Promote your permanent link - https://www.inspirock.com/slovakia/bratislava/hviezdoslavovo-namestie-a8163524147 - on your website, your blog, and social media. When a traveler builds a plan from this page, the itinerary automatically includes Hviezdoslavovo Namestie. This is a great way for travelers looking for a great vacation in your city or country to also experience Hviezdoslavovo Namestie. Promoting your link also lets your audience know that you are featured on a rapidly growing travel site. In addition, the more this page is used, the more we will promote Hviezdoslavovo Namestie to other Inspirock users. For best results, use the customized Trip Planning Widget for Hviezdoslavovo Namestie on your website. It has all the advantages mentioned above, plus users to your site can conveniently access it directly on your site. Visitors to your site will appreciate you offering them help with planning their vacation. Setting this up takes just a few minutes - Click here for instructions.